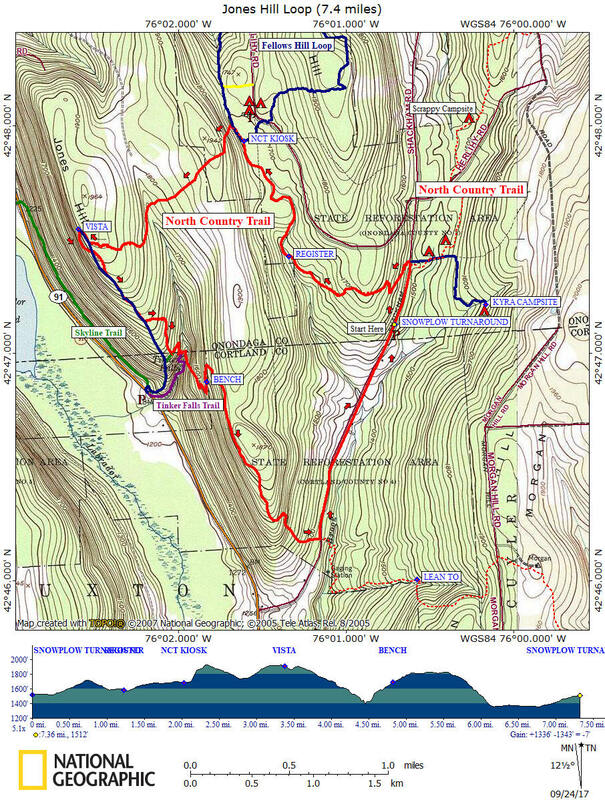 This hike utilizes a part of the blue blazed North Country Trail and paved Shackham Rd to create a loop of 7.4 miles in Morgan Hill State Forest and Labrador Hollow Unique Area. This loop hike features the views from the vista on Jones Hill aka the hang glider spot. You'll also pass by the scenic Spruce Pond. This moderate to difficult hike has an overall elevation change of 1336 feet. This is basically the western side of the popular Morgan Hill Long Loop. Be sure you have enough water/snacks and proper gear, including proper footwear before you attempt this hike. The North Country Trail coincides with the Onondaga Trail, which is a branch trail of the Finger Lakes Trail System. Directions: From Lafayette, US 20 East then right on Apulia Road. Turn left on NY 80 East, then right NY 91 in Apulia. Pass the Tinker Falls parking area and soon turn left onto Shackham Rd. Continue to a snowplow turnaround on your right just north of the Onondaga/Cortland County line (across from a Morgan Hill State Forest DEC sign). Be wary of parking here during wintry weather, especially between November 1 to May 1. The GPS coordinates of the snowplow turnaround is N42 47.125 W76 00.707 for those who have a GPS devise in their vehicle. Follow the paved Shackham Road north for about 0.3 miles until you reach the crossing of the blue blazed North Country Trail. You may see cars parked along the shoulder at this popular spot in Morgan Hill State Forest. Turn left and follow the blue blazed NCT uphill. You are heading the opposite from where the wide shoulder parking is and not toward Shackham Pond. You will be climbing quickly and then descend toward a small stream. 0.0 1519 feet From the snowplow turnaround on Shackham Road, head north following the paved road. 0.3 1529 feet Reach the crossing of the blue blazed North Country Trail. Turn left off the road and start following the blue blazes of the NCT. Ascending fast. 0.75 1716 feet End of climb, start descending toward small stream. Pass trail register and soon cross small stream. The trail will be following this scenic stream for a bit. Orange blazed Fellows Hill Loop goes straight and blue blazed NCT turns left and steeply ascends. Turn left. End of climbing. Soon you'll be leaving Morgan Hill State Forest. Reach the hang glider service road. Turn right and follow road to vista. Still following blue blazes. 3.4 1910 feet Spectacular views from the vista on Jones Hill aka the hang glider spot. Follow blue blazes near edge of view. Cross hang glider service road. 3.7 1871 feet Turn left and follow hang glider service road downhill. Turn left off service road and follow blue blazes on the foot path. Junction of the orange blazed Skyline Trail on your right. Turn left and follow blue blazes, soon switchbacks. Junction of the Tinker Falls Trail on your right. Continue on the NCT. Cross small stream near top of waterfall. Start climbing stairs. Steeply ascending. 4.85 1690 feet Stone bench just at the right spot. Still ascending. Finally the end of the steep ascent. 5.5 1831 feet Start of a steep descent toward Shackham Road. Trail register and then reach Shackham Road. Turn left and follow paved road. 7.4 1519 feet Reach the snowplow turnaround and of of this loop hike.